Wine & Spirits | Visit Butler County Pennsylvania! Enjoy a weekend of wines and spirits and we don’t just mean the alcoholic kind! While savoring (and even making) wine, cider and beer, explore some Butler County sites haunted by spirits. Work your way through these stops at your own pace. When you’re ready for rest, check out hotels in Cranberry, Butler, or Slippery Rock. Our first spirited stop is Wooden Cross Cemetery near Cabot. This site, marked by the remains of the original “wooden cross,” is the location of a mass burial site of those that died from a horrible flu epidemic in the 1800’s. These individuals were buried in unmarked graves and are represented by this single grave marker. There is a roadside marker about this site on the corner of Sasse and Cornetti Roads. Next, visit Cabot’s Winfield Winery. Winery offerings are diverse enough to appeal to a wide range of palates including Black, Yellow and Red Raspberry, Raspberry Apple, Vignoles, Riesling and Chambourcin to mention a few. Next stop, Cellar Works Brewing Company, that focuses on locally sourced ingredients brewed with a farmhouse philosophy. While heading into Butler you can stop at Stick City Brewing in Mars and Rustic Acres Winery. Deer Creek Winery on North Main Street and try their signature raspberry wines; Deer Creek Raspberry for those who prefer sweet and Raspberry Royale for those who prefer dry. Reclamation Brewing Company and Butler Brew Works are both on South Main Street in Butler and offer very different selections of beer. Reclamation has a dozen rotating beers brewed on-site and locally distilled craft cocktails. Be sure to try their home made chili or soup. Butler Brew Works offers a rustic industrial pub atmosphere. Paired with a Chef designed menu, it’s a destination for beer lovers and foodies alike. Recon Brewing is located on North Main Street Extension. Whether you're a craft beer enthusiast or are just looking to enjoy a night out with friends, you've come to the right place! On your way into Evans City, you can stop at Missing Links Brewery in Renfrew. Between rural Butler and Evans City, The Beacon offers a haunted house and corn maze during weekends in October! 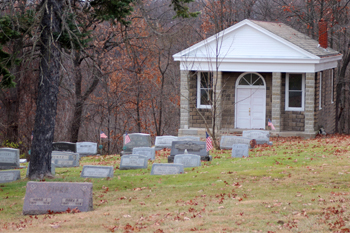 Evans City Cemetery is the next stop for spirits. Whether or not you believe the cemetery is haunted, be on the lookout for zombies. “Night of the Living Dead,” which revolutionized the horror film genre, was filmed here! When you're ready for a meal break, be sure to stop at Sports & Spirits on Main Street and try some of their award-winning wings! The southwestern corner of Butler County has quite a few stops, so choose as you wish. 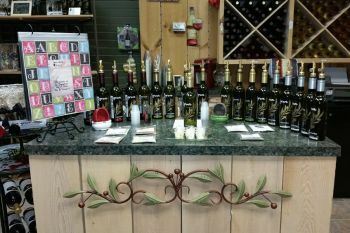 In Zelienople, try some fine wine at Mazza Vineyards’ Wineshop, located inside of Baldinger's. The shop features a selection of wines from Mazza Vineyards and South Shore Wine Company. 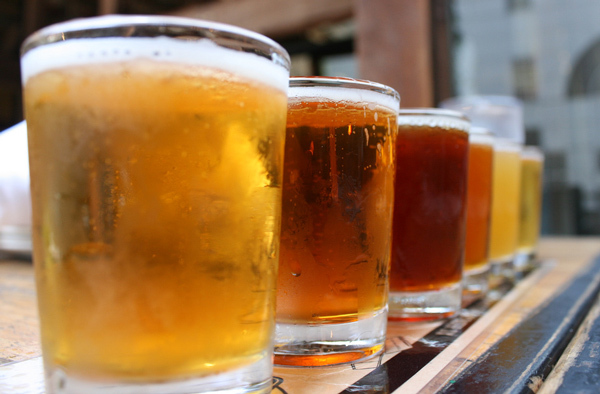 On Zelienople’s Main Street, visit ShuBrew: Handcrafted Ales & Food to enjoy their craft brews and "feed your sole." Dining in Harmony offers both kinds of spirits! 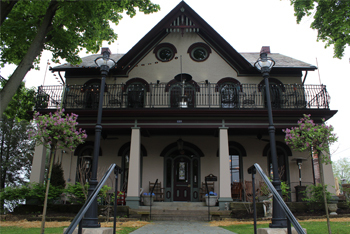 The Harmony Inn dates back to 1856 and there has been psychic documentation of friendly entities. See for yourself if you experience any unexplained images, air movements or electric impulses and enjoy a tasty dinner, while you're at it. The menu offers many traditional German recipes with a twist! If you're a fan of house brews you'll enjoy the vast selection they serve from Big Rail Brewing, located onsite, and a sister company of the Harmony Inn/North Country Brewing. Not far from the Harmony Inn, explore another cemetery. This one may look a bit odd though! The Harmony Society Cemetery in Harmony, PA has about 100 unmarked graves surrounded by a stone fence. The best part is a one-ton revolving stone gate - see if you can move it! An event to check out (if you visit in October) as you drive up Route 19 through Portersville is Cheeseman's Fright Farm, for a haunted hayride and haunted corn maze! Cheeseman's Pumpkin Festival is a more family-friendly daytime event where you can pick your own pumpkin, play in the hay maze or take a hayride. Our final dining spot possibly features both types of spirits! North Country Brewing Co. is housed in a former funeral home and brews beer right on the spot! In addition to delicious home brews, the food will definitely not disappoint! The menu features unique items such as frog legs and elk burgers, but even the pickiest eater will leave quite satisfied. A beautiful country drive on Kiester Road in Slippery Rock will take you to DR Distillery where they proudly serve hand craft and distill whiskies and rum using techniques handed down over the generations. We have two more sites with spirits... The first is at Slippery Rock University where the spirit of Emma Guffey Miller is said to haunt both Miller Auditorium (which was named after her) and North Hall, which was once an all-female dormitory. She has supposedly been spotted walking around and strange noises have been reported. The second is known as Deadman's Bridge, which you'll find by heading east on St. John's Road near Slippery Rock's Old Stone House. Rumor has it that if you stop on the bridge, you will see car headlights and screams from a husband and wife killed in a tragic accident.